I delight in autumn. To my eye, the garden is at its fullest when the dog days of summer are a recent memory. Layers of chlorophyll-filled foliage consorts with miraculous fall-flowering perennials. The richness of the fall garden reminds me of music that slowly builds upon itself, then crescendos and explodes. The problem with autumn gardens is not the absence of flowering fall plants, but in the general neglect of the season. Many view autumn as plant shut down time, a time to tidy-up before winter. All these things are true — but still, the autumn garden is a beauty. To many gardeners autumn is chrysanthemum time. 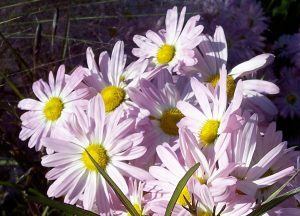 Mums can be lovely, but have you met their more relaxed cousins, fall flowering daisies? I treasure their mounds of single-flowered daisies and sweet nectar for migrating butterflies. They have blemish-free foliage and only ask for a sunny spot of modest fertility. You’ll be rewarded with copious blooms. Propagation is simple, and after two to three years divide plants in the fall and share. Their roots are fairly shallow and easy to dig. 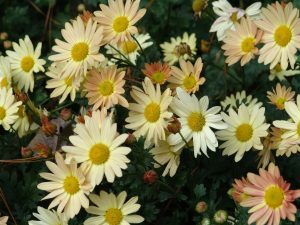 This sturdy daisy graces October gardens with 2.5″ soft apricot blooms that glow at dusk. Overcast days accentuate the soft coral color. Plants are compact and full, spreading 3-4′ and growing 2-3-feet tall. Expect butterflies to sup on the blossoms. Discovered as a self-sown seedling growing near a planting of ‘Single Apricot Korean’ at Niche Gardens. Distinguished by its color range, this fall daisy blooms range from almost white to pale pink, apricot and rose, undercut by luminous golden tones. Flowers tend to open dark and then lighten. ‘Country Girl’ brings soft rosy-pink flowers to the fall garden. Contrasting golden centers brighten up the fall garden on 3-foot by 3-foot plants. Everyone who sees ‘Country Girl’ wants the plant for their garden. Discovered by Dianne Ford, former nursery manager at Niche Garden. 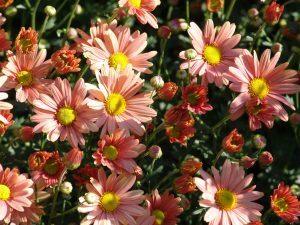 While gardening in Alamance County, she noticed darker flowers on one of the fall daisies. ‘Saxapahaw’, another offspring of ‘Single Apricot Korean,’ is the darkest flowering form: think dusky rose or terra cotta with a bright yellow eye fading to a peachy-rose color. 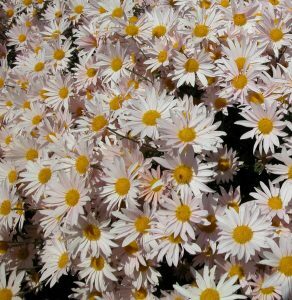 Vigorous plants bear mounds of open, single-flowered fall daisies from October through November. If traditional white daisy flowers are what you’re looking for, Montauk Daisy is for you. 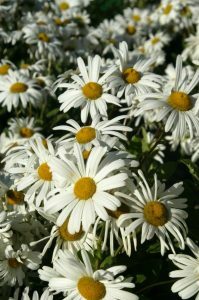 Shiny, leathery, pest-free foliage is topped September through October with sturdy, white 2-inch daisies. It’s salt and wind tolerant, too. Most gardeners in Charleston, SC, know of the late Mrs. Robinson who was an avid gardener with a garden filled with wonderful flowers. This was a passalong plant to me from Ruth Knopf, noted horticulturist and rosarian who gardens in Mt. Pleasant, S.C. The plant offers lots of small reddish-bronze button daisies on 1-2 foot tall stems in late fall. A stunning plant combination is Sedum ‘Autumn Joy’ backed by ‘Mrs. Robinson’ and Aster ‘Lady in Black’. Give fall daisies a try. Their ease of culture, late season bloom, and cheerful flowers will bring much beauty to your fall garden.